You are here: Home » Vitamin what? What vitamins and minerals do Strawberries have? Vitamin C and a little potassium. How about Bananas? Vitamin C, B-12 and also quite a bit more potassium. Like many of you I know we need vitamins and minerals for healthy bodies but other than Vitamin C might help you get over a cold (differing of opinion on that), Vitamin D and calcium helps with bones and potassium can keep you from getting muscle cramps. What about the other alphabet of vitamins? Let’s take a quick look. Vitamin A – Helps vision; helps to build and maintain skin, teeth, bones and mucous membranes. Found in milk, eggs, liver and fish oil. Vitamin B1 (Thiamin) –Helps convert carbs into energy, brain, nerve cells and heart function. Found in grains, beans, meats and nuts. Vitamin B2 (Riboflavin) –Helps cells use oxygen to release energy from food, growth and production of red blood cells. Found in dairy, meat, chicken and leafy greens. Vitamin B3 (Niacin) –Helps skin, tongue, digestive tract and nervous system. Found in nuts, meat, fish, chicken and dairy. Vitamin B5 (Pantothenic Acid) –Helps metabolize fat. Found in whole grains, egg yolks and milk. Vitamin B6 (Pyroxidine) –Helps maintain health of skin and red blood cells. Found in whole grains, bananas, beans and nuts. Vitamin B12 –Helps growth and production of red blood cells. Found in liver, beef, pork, poultry and eggs. Vitamin C (Ascorbic Acid) –Helps protect against infection. Found in citrus fruits, strawberries, tomatoes, peppers and other veggies and fruits. Vitamin D –Helps strengthen bones and teeth. Found in milk, fish oil and exposure to sunlight. Vitamin E –Helps maintain involuntary nervous system and vascular system. Found in vegetable oil, nuts, leafy greens and asparagus. Biotin (Vitamin B) –Helps breakdown protein, carbs and fats. Found in egg yolks, milk, vegetables and fruits. Folate (Vitamin B) –Helps produce energy and produce red blood cells. Found in leafy greens, beans and broccoli. Calcium –Helps form strong bones and teeth. Found in milk, cheese, green veggies and nuts. Copper –Helps keep blood vessels, nerves and immune system healthy. Found in red meat, poultry, whole grain breads and mushrooms. Iodine –Helps the thyroid and metabolism. Found in milk, cheese and other dairy. Iron –Helps form hemoglobin which carries oxygen in the blood. Found in red meat, poultry, eggs and whole grains. Magnesium –Helps bone growth and normal heart rhythm. Found in peanut butter, spinach and fish. Phosphorus –Helps with bones, teeth and energy production. Found in nearly all foods. Potassium –Helps muscles, heart and kidneys. Found in unprocessed fruits and veggies. Zinc –Helps growth repair and immune system. Found in red meat, fish and legumes. 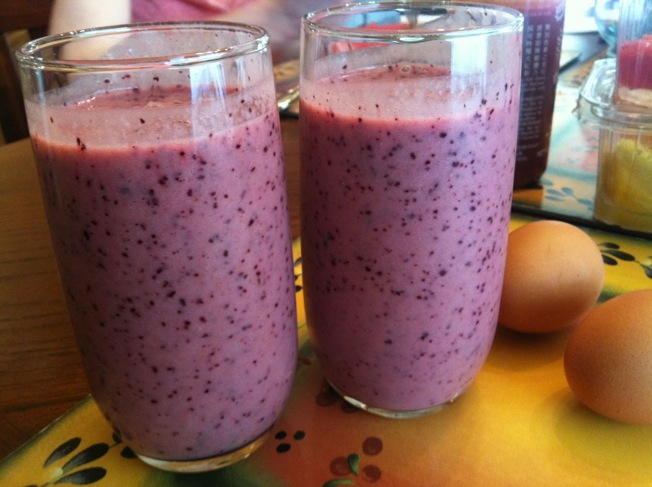 These vitamin C, B12 and potassium smoothies also taste just awesome! 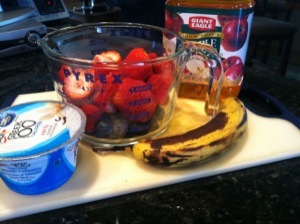 I used some lower calorie vanilla greek yogurt. All in the Blendtec blender. A fresh tasting, vitamin filled breakfast! 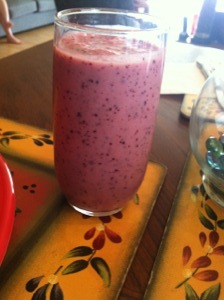 This smoothie looks delicious. Especially with a hint of vanilla. Thanks for sharing the recipe. How do you like your blendtec? Love it. It has performed well against everything I’ve thrown at it. I’m going to try it soooon! This looks fabulous. 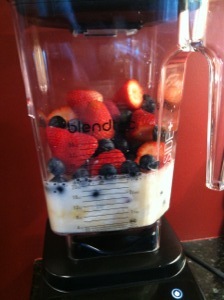 I adore my Blendtec too – I don’t know what I ever did without it!